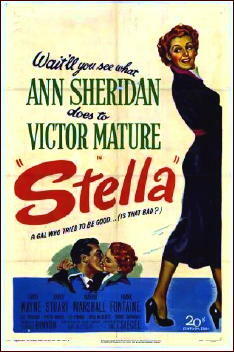 » Movie Review: STELLA (1950). STELLA. 20th Century-Fox, 1950. Ann Sheridan, Victor Mature, Leif Erickson, David Wayne, Randy Stuart, Marion Marshall, Frank Fontaine, Evelyn Varden. Based on the novel Family Skeleton (Doubleday Crime Club, 1949) by Doris Miles Disney. Screenwriter & director: Claude Binyon. If there is a noir film that’s also an out-and-out comedy, not a black comedy, this one might be it. Or at least it would if it had more than the 20% noirish elements to it than I’d gauge that this one has. Stella, as played by Ann Sheridan, is the center of the film, and if my 20% figure is right, she accounts for 95% of it. She’s Stella Bevans, in this one, the hard-working secretary of a real estate and insurance agent in an unnamed seashore community. By default, or so it seems, she’s also the “all but” fiancée of her boss, a rather uninspired if not inept fellow by the name of Fred Anderson Jr. (Leif Erickson). 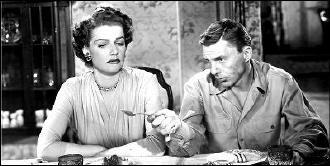 Stella is also the main means of support for the rest of her family, her mother, two sisters, and the respective husbands of the latter (David Wayne and Frank Fontaine), two gentlemen who work only during the summer season, then spend the other nine months on unemployment insurance. So Stella’s world-weary and disillusioned, and prone to fighting off her boss as he chases her around her desk after hours. Literally. Entering at precisely that moment is Jeff DeMarco (Victor Mature), an investigator from the home office, who’s been assigned to check up on Fred. The new man in town is attracted, she’s not and she makes no bones about resisting his advances. All of which has nothing to do with the story, which really is about Uncle Joe, Stella’s mother’s no-good brother-in-law, who was killed in an accident, but fearing they wouldn’t be believed, Stella’s family, unbeknownst to her, buries him and claims he’s off on another of his binges. And no matter how she turns, Stella finds herself getting deeper and deeper into supporting their story, the passing of time making it more and more difficult to tell the truth. Where does the humor come in? As more and more dead bodies are found, Stella’s two brothers-in-law keep claiming them to be Uncle Joe, who as it also turns out, had a $10,000 life insurance policy, with double indemnity kicking in in case of accidental death. I laughed out loud at least a couple of times, alone in a room by myself, and that almost never happens. But stuck with Fred, unable to act on her growing attraction to Jeff, and fed up with the antics of her family, Stella finds nothing to smile about, a heroine in a tidal wave that’s slowly taking her further and further out to sea. David Wayne’s knack for comedy I had not realized before, what with his wild schemes to collect the money (actually due them), he later to become Inspector Queen to Jim Hutton’s TV EQ. The other brother-in-law (Frank Fontaine) is the dopier one, but thankfully not as dopey later on as Crazy Guggenheim on The Jackie Gleason Show. 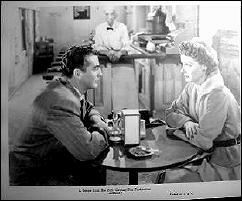 But it is the charmingly disillusioned-with-life Stella, played by the richly deep-voiced Ann Sheridan who’s the star here. Victor Mature is her co-star, but even he diminishes in star power whenever he’s in the same room with her. Sheridan wasn’t called the ‘Oommph girl’ for nothing, and she has a way with wise cracking ladies who have had a bit more of life than they’d like. Her delivery of lines in this and similar films is always dead on, never a false note. And of course cartoon fans know she was the model for Tex Avery’s Red Hot Riding Hood. I think you are right about this one. I can only think of a handful of films that are in the same category — UNCLE HARRY and Hitchcock’s THE TROUBLE WITH HARRY among them. Most mystery comedy tends to be more along the screwball school of IT’s A WONDERFUL WORLD or MURDER HE SAID, but this one seems closer to noir. Re David Wayne, though he did dramatic roles such as playing the Peter Lorre role in the remake of M or the husband in THREE FACES OF EVE I always thought of him in his comic roles such as the amorous friend of Tracy and Hepburn in ADAM AND EVE, Frank Sinatra’s married buddy in THE TENDER TRAP (opposite Celeste Holm), or the mild mannered guy who wins Marilyn Monroe’s hand in HOW TO MARRY A MILLIONAIRE. This one is a good little film, well worth discovering. The film doesn’t seem to be available and the book costs a minimum of $25 for an 1972 Berkley paperback edition! A lot of older Doris Miles Disney is expensive! David, thanks for reminding me of some of David Wayne’s more comedic efforts, none of which came to mind when I dashed off that line about him. One thing that I meant to include in the review, and either I forgot or I couldn’t decide how to fit it in, is that the Jeff DeMarco of the movie (in the guise of Victor Mature) was actually one of author Doris Miles Disney’s continuing series characters. In fact FAMILY SKELETON was the second of eight cases for Jeff DiMarco in Disney’s overall output (note the slight change in spelling), spread out between 1946 and 1971. I’ve not read the novel, so I can’t report on the romance that’s a key ingredient of the movie, but the comedy aspects are a definite part of both. Looking around for a copy of the movie, someone has a copy for sale on eBay. Of course he wants $20 for it. On the other hand, that’s less than fellow who wants $25 for the paperback, and you’re right, that’s the bottom of the scale. I knew Doris Miles Disney was popular, back when she was writing, but still that popular today? It’s hard to believe. I think Disney is more collectible than popular. Some of the titles were fairly pricey back in the heyday of my collecting phase, but I had assumed the Internet had brought the price down as it has for so many books. Maybe it’s a problem of scarcity rather than popularity. Or maybe some savvy booksellers are watching reviews here and raising prices when something appears. Disney was a good writer though, and I can’t believe I didn’t make the Jeff De Marco connection. Must be slipping (or napping). This one is a good movie, just the right blend of murder and comedy for that classic black comedy mix that is so hard to bring off. I’ve always disagreed with Leonard Maltin on this one. I think the comedy and murder elements blend exceptionally well. We probably should warn anyone looking for this one to make sure they are getting this though, and not the 1990 remake of STELLA DALLAS with Bette Midler also entitled STELLA. As I should have warned anyone looking for THE EAGLE AND THE HAWK — reviewed above — be sure they are getting that and not the WWI aviation film with Frederic March and Cary Grant of the same name. You can get stung if you aren’t paying attention. I LOVE this movie…hope they put it out on video someday.